3.5 (based on 3 ratings) Thanks for your rating! Product #20837 | SKU SAXPESC | 3.5 (based on 3 ratings) Thanks for your rating! 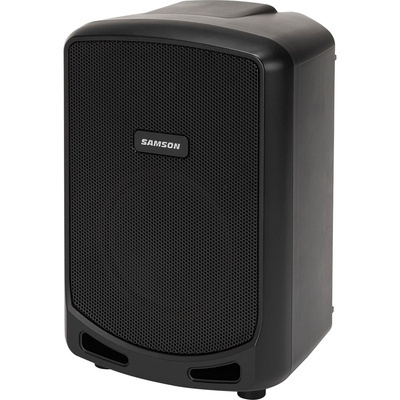 Provides sound in any environment; BBQs, parties, etc. When you need to provide sound in any environment the Expedition Escape Rechargeable Speaker System with Bluetooth by Samson can get the job done. It is ideal for BBQs, parties, outdoor sporting events, tailgates, presentations, fitness classes, and more. It weighs 8.5 pounds and features Bluetooth connectivity, for wireless audio streaming from your smartphone, tablet or laptop up to 50' away. Built with a 2-channel mixer that offers a 1/4" input with its own dedicated volume control, for live performance applications, including use with dynamic microphones, the built in 6" subwoofer for bass and a 1" high frequency driver, deliver all the details of your favorite tracks. When looking for a speaker to use anywhere, full-range sound is desired, and the Escape gets the job done. In addition the Expedition Escape has a 1/8" input for directly connecting MP3 Players, keyboards, and more. An internal rechargeable battery, powers the system for up to 20 hours of continuous use, on a full charge. The integrated carry handle make this portable speaker ideal for activities like trips to the beach, camping, boating, picnics and anywhere else music can enhance the moment.